Tree trainer and professional pruner of Himachal Pradesh, Pankaj Negi, has advised apple growers to shun massive pruning and cutting of new spurs and shoots in the growing apple and pear plants. He said that prevalent and old practices of massive pruning are leading to major downfall in the yield and delaying and retarding gestation of new plants. Interacting with various groups of farmers at Dalash in Kullu district; Rohru, Jubbal and Kotkhai in Shimla district and Sangla of Kinnuar, Negi said that massive pruning of the plant and high radial cuts may amount or lead to peeling off of the entire primary stem’s skin, which in turn heavily damages the plant and drastically reduces the plant growth and yield. 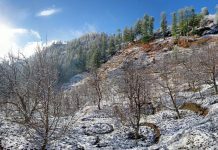 Apple growers in Himachal are currently engaged in fertilizing, smoothing the tree beds, planting new root stocks, grafting and pruning their orchards. To procure a heavy yield from young trees from the third and fourth years of new plantation, Negi suggested to allow maximum ‘beema’ on primary and secondary branches. Fruit buds should not be left on tertiary and periphery branches, as owing to less sap that reaches these branches, it will push less flower buds and lead to low yield. He gave an example of a water supply channel of a village, where the last house is likely to receive minimum supply of water. He said growers should remove such branches which stop the sunlight and air into the plant in very early growth of plant after converting them to fruit spurs. One should not remove branches from the middle, as it reduces the strength of the tree and branches. Branches, which are not desirable should be cut or peeled off at the apical buds immediately after harvest or in early autumn. Negi said that seedlings and root stocks plantation should be pruned differently, as root stocks have an early gestation period and grow fast. Farmers in the state are opting for massive vegetative or carbon growth of plants, which should be converted into more fruit spurs at a very early age of a plant so they could get maximum yields and achieve early gestation. He advised the apple growers to restrict the plant height to 12-foot and ensure that maximum water shoots are converted into fruit buds or branches after laying off the top. Water shoots, he said, have very high potential of growth as they carry maximum sap. They should be pruned in a manner to be be allowed to convert into young branches as they would push up more fruit spurs at a high pace and give more yield. 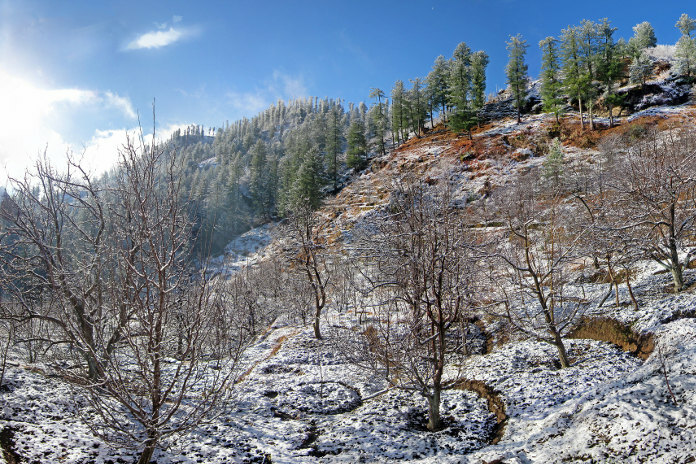 Many apple growers of Kullu, Negi said, were going for very high apple trees and opting for ornamental pruning. This, he said, was retarding the yield. Rather than making the plant good looking or ornamental, he appealed to the apple growers to concentrate on more fruit spurs. Pruning should be oriented towards allowing more space for air and light reaching inside the plants. He also advised to graft pollinators appropriately to help good fruit setting, which also leads to a good yield. He warned that pruning bluntly in the middle of growing branches, would lead to dry stubs and lessen the plant’s prospect of living for a long period. 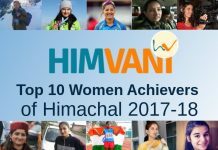 Apple is the back bone of Himachal’s economy as more than three lakh households are entirely dependent on it. Apple fetches about Rs 4,000 crore to state GDP every year and is largely grown in Shimla, Kullu, Mandi, Chamba, Sirmaur, Kinnuar and Lahaul Spiti districts of the state. Next articleसाक्षात्कार: किसे मानती हैं प्र मं को एस्कॉर्ट कर चुकीं हिमाचल की बेटी आरती अपना आदर्श? ML Verma is a Senior journalist, with more than a decade of experience of active reporting for electronic media, news agencies and fast paced online media.